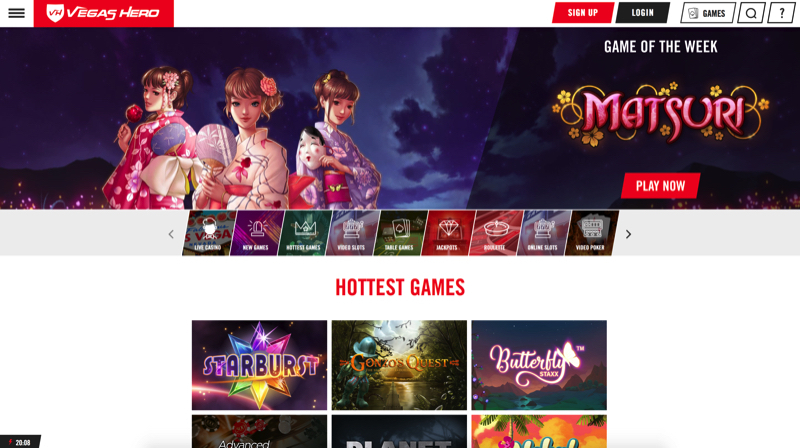 Vegas Hero is a relatively new online casino, which was launched in 2017. It serves hundreds of video slots and casino games from some of the biggest names in the industry. The casino can be accessed instantly through a web browser or members can user their mobile casino. Vegas Hero is licensed and regulated under the laws of Curacao, Malta and the UK. Vegas Hero is powered by Evolution Gaming, Microgaming, NetEnt, NextGen, Play’nGo and QuickSpin. There are several recurring promotions plus a loyalty and a VIP program. Vegas Hero support bank transfer, credit cards, e-wallets and instant banking methods for several currencies. The withdrawal limit is £€$22,000 per month. Higher limits are available. The casino is in English, Finnish, German, Norwegian and Swedish. Their helpdesk is 24/7 available by chat, email and phone. Due to legal restrictions, players from the following European countries aren’t allowed to play at the casino: Denmark, France, Hungary, Portugal, Romania and Spain.